What's Up With All The Fake Brides On Hawaii Beaches? What’s Up With All The Fake Brides On Hawaii Beaches? 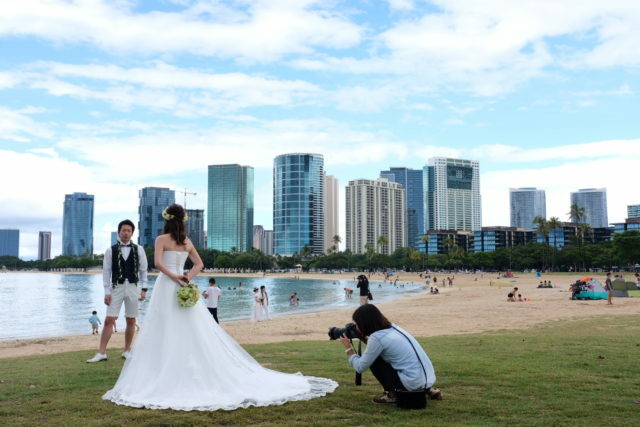 Honolulu is full of Japanese tourists in wedding attire, but many are there just for the photos. Go to just about any crowded beach in Honolulu, and you’ll see them: a seemingly never-ending stream of brides in white satin and tulle, escorted by grooms in nuptial frippery—natty bow ties, vests and, increasingly, Bermuda shorts. It looks like a sign of what tourism executives call Hawaii’s “romance market,” a vibrant travel sector with half a million annual visitors coming for weddings and honeymoons. But there’s a twist: many — probably most — of the wedding couples posing on the beach aren’t really getting married during their visit to Hawaii. Some are already married, and others will tie the knot after going home. Joji and Maaya Saito of Tochigi, Japan, were among the couples at Magic Island on a recent morning. The honeymooners got married at home but donned wedding attire for the shoot with photographer Naoki Tsukada. It’s just another thing to do while on vacation in Hawaii: don wedding clothes and take a limo to the beach for a professional photo shoot. It’s especially big, it seems, in Japan. “We don’t have a restriction on who can buy our packages,” explains Haruka T. Hopper, wedding section general manager of Royal Kaila Wedding & Spa at the Waikiki Beach Marriott hotel, which markets wedding packages to Japanese travelers. The result: 80 to 90 percent of the nearly 400 wedding couples Royal Kaila shoots each month — mostly at the beach, but also in Waikiki and Chinatown — aren’t really getting married. Haruka T. Hopper, wedding section general manager of Royal Kaila Wedding & Spa at the Waikiki Beach Marriott, shows off some of the more than 200 wedding dresses available for weddings and photo shoots. The importance of Hawaii’s romance market is well documented. According to Hawaii Tourism Authority data, approximately 657,000 people came to the Aloha State for weddings and honeymoons in 2016. More than a third of them came from Japan. The HTA, which uses hotel tax revenues to market the state, makes a point of selling the romance of Hawaii, said Jennifer Chun, the HTA’s director of tourism research. 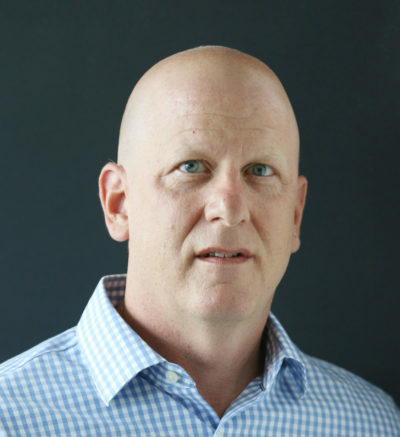 The HTA’s statistics are unusually detailed, based on visitor questionnaires filled out by travelers on inbound planes, but they apparently don’t catch everything. While the statistics capture people coming for real weddings and honeymoons, they don’t account for the people who are so apparently smitten with Hawaiian trade winds and sunsets that they can’t resist getting dolled up in wedding garb and documenting their trip with the help of a professional photographer and photo assistant. Chun said she was surprised to learn that many of the couples seen on the beaches aren’t really getting married. “It’s apparently more romantic than our stats show,” she said. Yugo and Mina Ishii aren’t having their wedding ceremony until next year but opted for a Hawaii photo shoot on the advice of a travel agent back home in Japan. On a recent morning at Ala Moana Beach Park, beachgoers set up camp in the sand. Joggers ran on the oceanside path around Magic Island. And the wedding couples rolled in, with attendants holding up the trains of their bridal dresses. Among them were Joji and Maaya Saito of Tochigi, Japan. The bride wore white; the groom a navy blue vest, bow tie and shorts. They didn’t seem to mind the yogis on stand-up paddle boards doing downward dog in the ocean behind them. Joji said the couple had gotten married back home in Japan and were in Hawaii for a 10-day honeymoon. The wedding pictures, he said, were just a souvenir. Cinevie.tv, which arranged their shoot, also does full service weddings. But about 70 percent of the people who do wedding photo shoots each month have already been married in Japan, says Yoshi Osato, Cinevie.tv’s president. Other wedding couples on Magic Island were planning to have wedding ceremonies later this year, but went ahead and got some wedding pictures while they were visiting Hawaii. Among them were Akira and Nanako Nishimura of Yokohama. The couple are planning a wedding ceremony in September in Japan but booked the photo shoot at the advice of a Japanese travel agent, Akira said. Another couple from Japan, Yugo and Mina Ishii, had a similar tale. They, too, aren’t having their ceremony until next year. So why do a professional photo shoot? “If we’re coming all the way to Hawaii, we wanted to make photographic memories,” Yugo said. 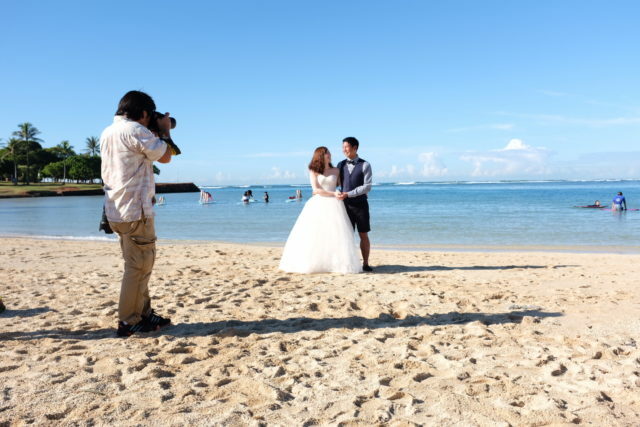 If Nishimura and Ishii are any indication, a driver of the wedding picture trend may be Japanese travel agents, which are offering the packages on the menus of activities that people sign up for when planning trips. The agents get a commission, and the Hawaii photographers, limo drivers, and hair and make-up stylists get work. The push by travel agents makes sense. According to the HTA, some 36,274 Japanese visitors came to Hawaii to get married in 2016; by contrast, 226,833 came for honeymoons. In other words, selling wedding packages to honeymooners increases the potential market by six times. Bermuda shorts and vests, are the most popular choice these days for men for wedding shoots, says Haruka T. Hopper, wedding section general manager of Royal Kaila Wedding & Spa. Hopper runs a veritable wedding factory out of the Marriott. In addition to hair and makeup stylists, the shop has a selection of silk flower bouquets, a menu of men’s outfits and more than 200 wedding dresses for women to choose from. The men can get mini-massages while their partners get made up. Basic packages include hair, makeup, wedding dress and floral bouquet for the woman and a formal outfit for the men, limousine transportation, a photo shoot and 100 digital pictures. Location options include beaches, or town scenes like Waikiki and Chinatown. Of course, Royal Kaila also does full-service weddings with marriage ceremonies, Hopper said. But the vast majority of the packages it sells are just photo shoots, Hopper said. A basic “Princess on the Beach” package sells for $670, while the “Downtown & Sunset on the Beach” package goes for $1,270. So why spend so much for even more wedding pictures. The reasons vary, Hopper said. Some people are celebrating anniversaries.